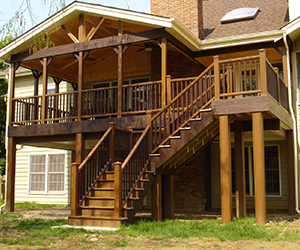 Aesthetic Design & Build is the premier installer of composite decking solutions in St. Louis and St. Charles County. This synthetic material is a cost-effective means of building a beautiful non-wood deck on to your home that is virtually maintenance free. This realistic-looking composite wood is made from synthetic materials including recycled plastic and wood fibers. The man-made material can withstand years of wear and tear without requiring the annual staining and maintenance that comes with owning a hardwood deck. Growing in popularity among homeowners, this composite decking material is the perfect solution for anyone that wants a stunning and functional outdoor living space that does not require consistent upkeep. St. Louis experiences drastic changes in weather patterns, making traditional hardwood decking a challenge to maintain. 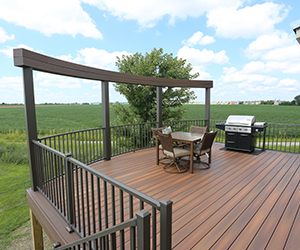 With a composite deck, your new outdoor living space will flawlessly go through icy winters and scorching summers alike without worry of warping and fade. Composite deck boards are easy to clean and eliminate the worry of needing to restain after pressure cleaning or cleaning with other harsh chemicals. All composite decks from Aesthetic Design & Build in St. Louis are backed by our builders guarantee and come with an additional fade warranty. 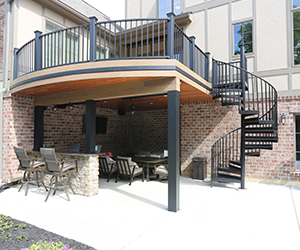 For more information on composite decking solutions from our luxury brands including: Timbertech, Trex, Azek and many more, contact us or call 636-532-5008 today!